The Cheticamp River Salmon Association and its Parks Canada partners completed their fifth and final year of instream work on the Cheticamp River in August. This year’s work has brought the total number of instream structures installed over the years to 70. The majority of these structures - mostly rock retarding bars (or groynes) and deflectors - were installed in sections of the lower river where the channel had become critically overwidened. Archie Doucette (left, Parks Canada) and Charles MacInnis (project consultant in charge of restoration design and construction of instream structures) oversee work at the Faribault Brook site. Catherine Thompson, CRSA’s Crew Supervisor for its student habitat restoration work crew, was on site to help with traffic control during this year’s instream work on the Cheticamp River. The 2018 instream work focused on three sites on the lower Cheticamp River: Faribault Brook (work took place on the Cheticamp River, above the confluence with Faribault Brook), Below Fence Pool, and at Petit Cap. Fish passage at these sites was not only limited by overwidened channels, but also split thalwegs, mid channel diagonal bars, and excess bedload deposition. These three sites had all been worked on in previous years of the Cheticamp River project, but revisiting them was important in order to address changes to the river that occurred as a result of a major flood three years ago (August, 2015). By adding an additional five instream structures (2 rock retarding bars, 2 deflectors, and a sill) and carrying out maintenance to some of the previously installed structures (4 rock retarding bars and a deflector), the restoration team is hoping to improve fish passage in some cases, as well as maintain the benefits achieved during the first few years of the project. Charles MacInnis overseeing maintenance work to a deflector below Fence Pool. The uppermost structure installed as part of the Cheticamp River restoration project (view looking downstream). This rock deflector was installed in August, 2018 above Faribault Brook. Seeing this project through to completion has been a major achievement for the Cheticamp River Salmon Association, and the timing was crucial. Human impacts (including past logging - pre the formation of Cape Breton Highlands National Park) had resulted in the channel becoming drastically over-widened in places along the lower river. In low water conditions, these wide, shallow areas were creating significant problems for migrating salmon. And low water conditions – once uncommon during the spring salmon run – have become a regular occurrence. The current trend of warmer winters and drier springs combined with less rainfall, contributes to lower water levels and higher water temperatures during the salmon migration. Without intervention, these human induced environmental conditions would continue to impact Atlantic salmon and other migrating fish, and the Cheticamp River’s important spring salmon run and the recreational fishery that it supports would eventually be lost. While the Cheticamp River restoration project wouldn’t have been possible without the support and collaboration from Parks Canada (Cape Breton Highlands National Park), a dedicated group of project partners who have supported the project since its start back in 2014 are also to thank for its success. These project contributors and funders include the Nova Scotia Salmon Association’s NSLC Adopt-a-Stream Program, the Atlantic Salmon Conservation Foundation, Sage Environmental Program, and the Atlantic Salmon Federation. Other funders who contributed to one or more years of the project include DFO’s Recreational Fisheries Partnership Program, Nova Scotia Power Inc., and Service Canada’s Canada Summer Jobs Program. Allyson Heustis with the Atlantic Salmon Conservation Foundation (left) and Jillian Baker, CRSA’s Project Manager, during a site visit this summer. Archie Doucette (Parks Canada), Rene Aucoin (CRSA President), and Charles MacInnis (Project consultant) (left to right) pose with signage from the Nova Scotia Salmon Association’s NSLC Adopt-a-Stream Program, one of the funders of the Cheticamp River restoration project. While it won’t be building structures in the Cheticamp River again any time soon, the CRSA has no intention of sitting idle. The Association is already partnering with Parks Canada on a water temperature study of the river and the Cheticamp reservoir, and this fall the CRSA is proposing its first official salmon redd count (redds are fish spawning nests) on the Cheticamp River. Volunteers will be needed, and a training session will be held later this fall. More information on this will be made available in the coming weeks. It’s time to get the waters flowing again! For the past few weeks Yvon (and the chainsaw) have joined the team to help us clear the waterways and gather material for more long-term installations. Once the sites were identified, with photos and notes gathered, we set off to Aucoin Brook and then Fiset Brook to do the work. Starting in Aucoin Brook, we had to find the right trees for the digger logs we were to install later in the season. This can sometimes take a lengthy amount of time, as there is a lot to consider. Finding a straight, recently fallen tree, within close proximity to the site is the ideal (and then is it long enough?). Once the right tree has been chosen, we measure, cut, clear and drag it to the site to be used in the future. Other jobs on the Aucoin Brook were clearing debris that may continue to clog or inhibit flow. The crew cleared much of the leaves and smaller debris before Yvon arrived so that it was easy cutting for him. More logs were set aside to block a section of the brook from becoming further divided. This week some serious clearing happened in Fiset Brook. The crew spent an entire morning clearing the first site with Yvon’s help (and still more to be done!) A channel switch, and an eroded bank are just two possible causes for the amount of debris to build over time. We are thankful for Yvon’s help, as we couldn’t do it without him. This week we held our annual Fly Fishing Workshop in Grand Etang. This is the first time that the CRSA opened the workshop to the community. Traditionally, the workshop is held at schools and is open to students only. The CRSA is pleased with the interest from adults and families in the area. The workshop was led by Lewis Hinks and Rene Aucoin. Hinks works for the Atlantic Salmon Federation, as the director of programs for Nova Scotia and he is an experienced mastercaster. Aucoin is the founder of the CRSA, and also holds many years of experience in fly-fishing. Unfortunately, the temperature was too warm to fish on the water. In warm weather, the fish experience stress and their mortality rate increases. Although the conditions were too warm to fish, participants enjoyed learning in the sun at the field behind St. Joseph du Moine. In addition to learning how to fly cast, participants learned how to tie leaders and hooks. Participants were happy to receive one-on-one instruction from Hinks and Aucoin on how to improve their casting technique. Fly Casting Workshop with a Master Caster! We are excited to be partnering with Master Fly Casting Instructor Lewis Hinks to offer introductory fly casting workshops in Cheticamp! These workshops will provide an introduction to the exciting world of sport fishing. Participants will learn the basics of fly fishing, with instruction and hands-on learning experiences with tying fishing knots, techniques for casting, and opportunities to practice hooking and releasing live fish. No prior experience is required in order to participate in the workshops. All that is needed is comfortable clothing, sunglasses or safety glasses (to provide protection for participants' eyes), and an interest in having a unique and exciting experience. Lewis Hinks has over 40 years of fly fishing experience, and has been teaching fly casting for the last five years. While Lewis enjoys introducing beginners to the sport, he also looks forward to opportunities to provide feedback and coaching to experienced anglers. Participants can sign up for a morning (9-12pm) or afternoon (1-4pm) workshop. Workshops will take place on July 31 (rain date of Aug. 1) in Cheticamp. For more information on this event, contact the Cheticamp River Salmon Association at cheticampriversalmon@gmail.com or phone CRSA President Rene Aucoin at 902-224-5854. Come experience fly fishing in Cape Breton and get hooked with us! The Cheticamp River Salmon Association is able to put on this workshop with help from Destination Cape Breton Association. This past month we have continued collecting data for our water temperature study in the Cheticamp River and Cheticamp reservoir. This study is being done with our partners at Cape Breton Highlands National Park. The purpose of this study is to record temperature fluctuations in the river and reservoir and determine the impact of these fluctuations on aquatic species. Below are some photos of the summer crew installing the temperature probes at various locations. The probes are installed at different depths (surface vs. bottom) and in different sections of the river (riffles, pools, runs). The probes will be collected in September. After 2 hours of driving we arrived at the Cheticamp Reservoir, ready to install 2 temperature probes in the lake. Thank you to DFO officers for taking us on their boat to deploy the probes. Deploying a (makeshift) probe in the Cheticamp Reservoir. What an adventure! We are very excited to introduce Sarah Lloyd (left) to our summer crew. Sarah will be helping conduct the study and also contribute to river restoration work throughout the summer. This photo was taken at the upper pools of the Cheticamp River where the team installed several temperature probes. Deploying a temperature logger at the Barrier Falls in the Cheticamp River. Our crew was accompanied by Parks staff who helped navigate the hike to the Falls. This past Sunday was our Annual Youth Fishing Derby. Despite the event being postponed from the previous weekend due to poor weather conditions, the CRSA was pleased with the amount of young anglers and their families that participated in the derby. Robert Leblanc kindly volunteered his pond in Plateau for the event, where there was no shortage of fish for the young anglers. This event, open for participants ages 16 and under, is an opportunity for youth to get outdoors and try out the sport. In addition to the fishing, there was a BBQ and refreshments, as well as prizes for the biggest fish caught (measured by weight). Special thank you to Robert LeBlanc for hosting the event. And to the local businesses who generously donated prizes for the top anglers. Finally, thank you to the families who came out and helped make this fishing derby another success. We hope to see you again next year! Petit Lac being stocked with fish for our fishing derby this weekend! Our annual fishing derby will run from 8:00am- 12:00pm on Sunday June 3rd at Petit Lac, Grand Étang. There will be prizes for top youth anglers (ages 16 and under) and a free BBQ! My name is Catherine Thompson and I will be the Stream Restoration Crew Lead for the upcoming summer. I am originally from Ontario but I am studying at St. Francis Xavier University in Antigonish. I am majoring in Aquatic Resources and will receive my undergraduate degree in 2019! 2018 Field Season, here we come! With May quickly wrapping up, we've decided that it's time for an important update on what the Cheticamp River Salmon Association is planning for our 2018 field season. To start, we're excited to be continuing to partner with Cape Breton Highlands National Park to expand the water temperature study that we initiated last year, and to complete additional instream restoration work on the lower Cheticamp River. The water temperature study we conducted last year focused on the Cheticamp River as well as the Cheticamp reservoir. Working with our Parks Canada partners, we deployed water temperature probes at key locations along the Cheticamp River and also at different depths in the Cheticamp reservoir (we were interested in whether a cold water layer exists at lower depths). Parks Canada also shared their historical water temperature data with us so that we could look for possible trends (e.g., warming or cooling). Last year's Field Technician, Gabrielle McLaughlin, recording water temperature data on a trip to the Cheticamp reservoir. After analyzing our data, reviewing our methodology, and discussing results with our project partners, we collectively decided that the study should continue in 2018. An additional season of data will help give us a better understanding of the Cheticamp River's water temperature profile as well as the situation at the reservoir. We will be providing updates once we get started on this important second phase of our study! In addition to our water temperature study, we will be working with Cape Breton Highlands National Park to address a number of loose ends in our habitat restoration project focused on improving fish passage on the lower Cheticamp River. Issues including extreme weather events (see our post on the flood in 2015) and shortened windows for instream work have meant that there is still some work to do to restore impacted habitat and remove potential barriers to fish passage at a few key sites along the lower Cheticamp River. Once our lead project consultant completes his spring site visits and provides an updated restoration plan for the Cheticamp, we will share details about this upcoming work. 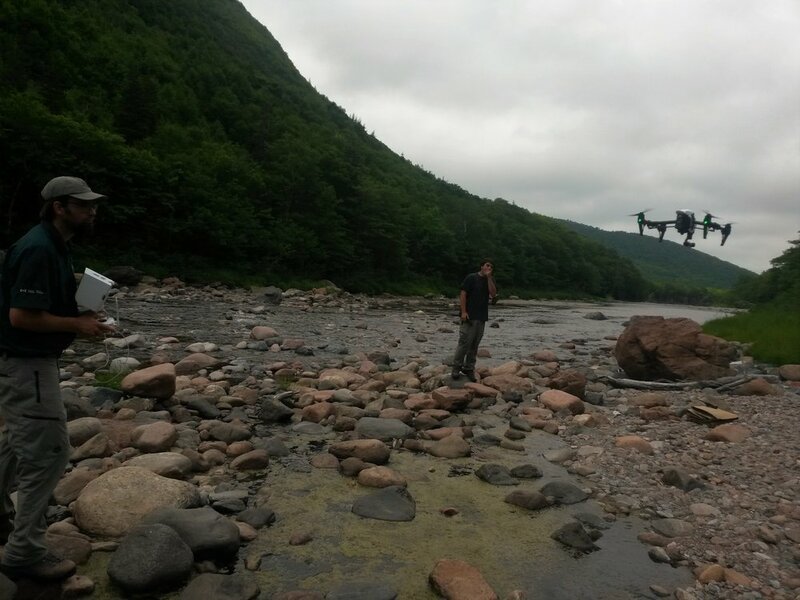 Parks Canada staff flying a drone last summer to help us to collect before and after photos and videos at our work sites on the lower Cheticamp River. Outside the Cheticamp River, we also have plans to improve fish passage on two smaller watercourses: Aucoin Brook (a tributary of the Cheticamp River), and Farm Brook (located just south of Cheticamp). Both of these brooks require the use of heavy equipment to remove blockages of large debris and open sections of infilled channel that have created serious problems for migrating fish. In addition to the heavy equipment work, we are also in the process of hiring students to work as part of our habitat restoration work ctew this summer. This team will be busy with a variety of work projects, including helping conduct water quality monitoring, carrying out maintenance to existing instream structures, and installing new structures as required. Stay tuned! We had another busy and productive field season here in Cheticamp this year. Thanks to the continued support and financial help from our project partners and funders, the Cheticamp River Salmon Association was able to continue work on important existing projects as well as take on some exciting new work in 2017. In particular, we would like to thank the following for helping make this another successful year: Fisheries and Oceans Canada (specifically funding from DFO's Recreational Fisheries Conservation Partnership Program and staff from the Conservation office in Cheticamp for their inkind contributions to our water temperature study), the Atlantic Salmon Conservation Foundation, Nova Scotia Salmon Association's NSLC Adopt-a-Stream Program, Parks Canada (specifically, staff at Cape Breton Highlands National Park for co-managing our Cheticamp River project and making important inkind contributions), Sage Environmental Program, the Cheticamp branch of the RBC, Destination Cape Breton Association, the Atlantic Salmon Federation (inkind contributions from Lewis Hinks, Director of Programs for Nova Scotia), and the Clean Foundation and Service Canada's Canada Summer Jobs Program for help hiring summer staff. 2017 marked our fourth year of habitat restoration work on the lower Cheticamp River, undertaken in partnership with Cape Breton Highlands National Park (CBHNP). This year our habitat restoration team installed thirteen new instream structures (a combination of rock deflectors and rock retarding bars, or groynes) and carried out maintenance work to two existing structures. The structures were installed at three works sites, above Fence Pool, below Fence Pool, and at Petit Cap (Gauge station). The restoration plan, designed by stream restoration specialist and former DFO Habitat Coordinator Charles MacInnis, called for the installation of structures at key locations to encourage the river to gradually narrow and deepen through overwidened sections, process bedload in locations where extreme bedload deposition had occurred, and improve fish passage through areas where divided thalwegs and mid-channel diagonal bars restricted upstream migration of Atlantic salmon and trout. One of the many ways that Parks Canada staff at Cape Breton Highlands National Park contributed to project on the Cheticamp River was by capturing before and after drone footage of the project work sites. The aerial photos and video are part of our efforts to document project achievements and evaluate the effectiveness of the instream work. Geomatics Technician Michée Lemieuxwith CBHNP flies a drone over project work sites prior to the start of instream work. 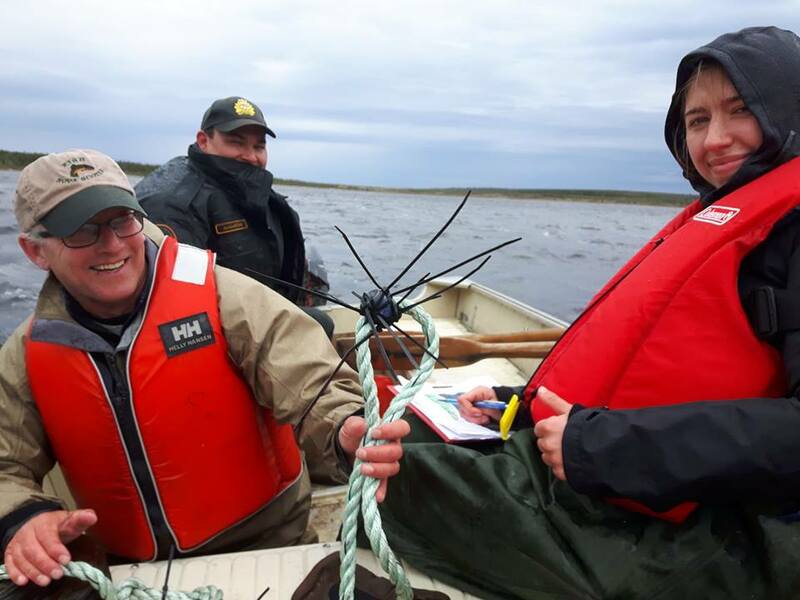 In addition to the instream work on the Cheticamp River, the CRSA also partnered with CBHNP to carry out a water temperature study on the Cheticamp River and the Cheticamp reservoir (source of the Cheticamp River and part of NS Power's Wreck Cove hydroelectric project). Both were interested in better understanding water temperatures on the Cheticamp River and at the reservoir as salmonid fish (including Atlantic salmon and trout) are sensitive to water temperature as it affects the availability of dissolved oxygen in the water and the metabolic rates of the fish. The combination of climate changes and unnaturally overwidened sections of the lower Cheticamp River – locations that result in warmer water temperatures due to the shallow depths, as well as insufficient depths for fish passage – has raised concerns about how water temperatures may be affecting the health of Atlantic salmon and native trout species on the Cheticamp River. The CRSA installed submersible probes to collect water temperature data at various locations on the Cheticamp River and at different depths through the water column in the reservoir.The CRSA also hired Gabrielle McLaughlin, a recent biology graduate from St. Francis Xavier University, to help carry out the study and prepare a report (still in progress) of the findings. Gabrielle MacLaughlin and Kayla Blackwood - crew supervisor for CRSA's Habitat Restoration Crew - deploying temperature loggers at Cheticamp reservoir. Thanks to DFO for providing access to a boat and operator for this part of our project. While not working onthe Cheticamp River, the CRSA was also busy getting work done on a number of smaller watercourses in and around Cheticamp. 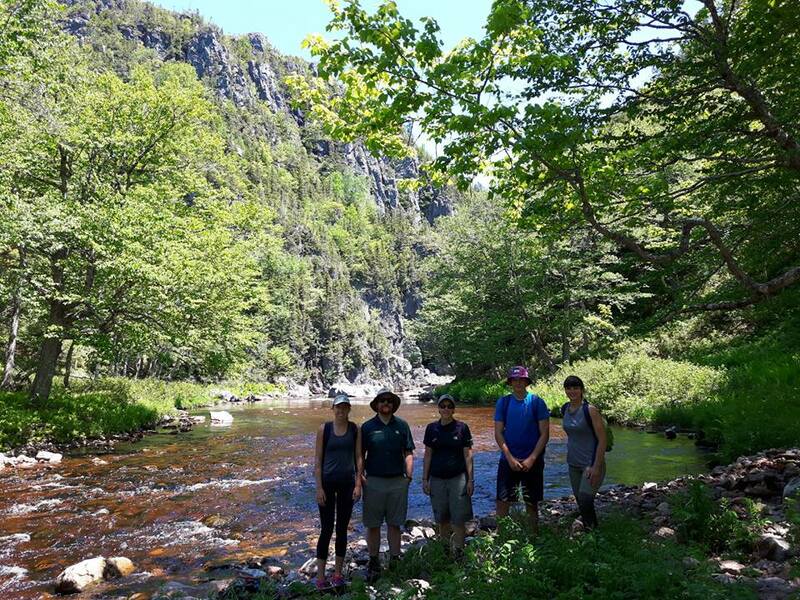 For example, Kayla Blackwood, a 1st year NSCC Natural Resources Environment Technology student, was working as the CRSA's Habitat Restoration Crew Supervisor, leading a variety of projects on Aucoin Brook, a tributary of the Cheticamp River. Kayla and her one man crew were able to get an impressive amount of work done, including removing blockages, carrying out maintenance to existing instream structures (mostly digger logs and deflectors), installing brush mats, helping with riparian planting, and conducting water quality monitoring. In addition to the work on Aucoin Brook, the CRSA also carried out some important fish passage work on Fiset Brook, and began fish passage work on Farm Brook (to be completed in 2018). Check back for updates on the results of the water temperature study as well as plans for next year. Hopefully we can continue to work with our partners to take on more interesting and important projects! 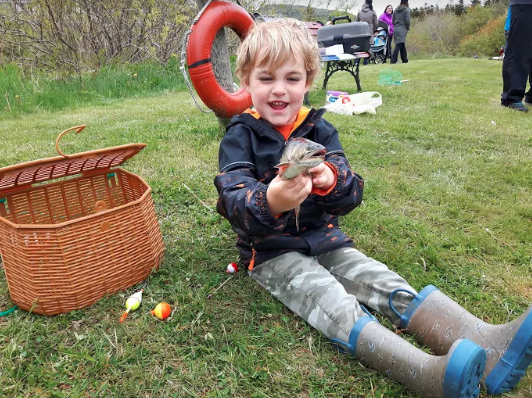 On the week of June 19, the Cheticamp River Salmon Association (CRSA) organized a tree planting event for the purpose of aquatic habitat enhancement. Along with help from Royal Bank of Canada (RBC), Cheticamp branch, Parks Canada staff as well as grade 3-4 teachers and students from NDA. The goal of this project is to contribute to our community by planting 1000 native specie trees in the Cape Breton Highlands National Park and various locations within the Cheticamp area. It is important to note that Nova Scotia is over 70% privately owned property, meaning that we the people are responsible for over 70% of what happens to our environment. This can be from a lack of knowledge, improper forestry activities, climate change, or a lack of disregard. Planting trees is a solution, but it should not replace protection of the remaining natural areas. Many wetlands, woodlots and other natural ecosystems are threatened by development, especially within and around urban areas. A healthy forest enhances the ecosystem as well as the quality of human life. Our plan is to plant the trees at least 20 meters from a watercourse, this is called a riparian area. A riparian area is a section of land that is adjacent to ditches, streams, brooks, lakes, and different types of wetlands. These areas support a mixture of vegetation, from trees and shrubs to emergent and herbaceous plants. The vegetation in riparian areas directly influences and provides important aquatic and terrestrial habitat. They are also important for stream bank stabilization; erosion control, the roots from the trees help support the banks along a watercourse. They also lower water temperature; with the increase in shade the water stays cooler for the fish and other aquatic life in the watercourse. Provides shelter for fish and a source of food from the insects, leave litter, and other organic materials that fall into the water from the vegetation above. Over the past few years Cape Breton has experienced flash floods that have lead to extensive damage of not only residential areas but forested areas as well, an example of this would be the lower half of the Cape Breton Highlands Nation Park which is also where we planted. Much later these trees can help with flood prevention. The mature vegetation along the watercourse helps to slow down or block the water from coming though. The Acadian Forest Region grows over most of the Maritime Provinces, the Acadian Forest is closely related to the Great Lakes-St. Lawrence Forest and to a lesser extent, the Boreal Forest. Red spruce, along with yellow birch, sugar maple, red pine, eastern white pine and eastern hemlock are just a few of the tree species native to the Acadian forest. Thanks to the RBC for providing us with the funding we were able to purchase and plant 1000$ worth of these Acadian forest species. The CRSA purchased the tress from Scott & Stewart Forestry, which is a tree nursery located in Antigonish. On June 21 and 22 roughly 500-600 trees were planting in the camp ground and on the salmon pools trail. A big thanks to the hard work and dedication by Chris and his crew from Parks Canada who not only helped us plant but also helped us prepare the site for planting. We could not have done it without their support. Thank you to the RBC for allowing us to take part in such a rewarding community project and to be able to give back by making a difference. Also, for taking the time to come down on a Friday evening and plant with us. We also want to thank local landowner, Arthur Cormier, for providing us the space needing to make this venture a success. More great things happening here in Cheticamp for the CRSA. On June 14, 2017 I met with the Fraser Mills Fish Hatchery truck at the college DE L’Acadie in St. Joseph du monie. Prior to heading out many different watercourses in the area were chosen to be stocked and the hatchery had delivered 2,200 brook (speckled) trout. We started off at Farm Brook, which runs past the Cheticamp Back Rd, and was stocked with an estimated 500-600 trout. The Second stream that was chosen was Fiset brook, which flows adjacent to Le Platain Rd where an additional 500-600 trout were released into the brook. We then decided to make some stops along the Cheticamp Back Rd to two different small ponds that I am told are frequently fished by younger local anglers. Approximately 150-200 trout were released in each of these ponds. Our last spot was Aucoin’s Brook, off Prairie Rd in Petit Étang where we realized the remining 700-750 brook trout. These types of fish stocking are done annually twice a year. Once in the spring and again in the fall. These projects are important to supplement existing fish populations, or to create a population where none exists. Stocking also benefits the recreational fishing in our area, but can also be done to restore or increase a population of threatened or endangered fish. Overall it was a great day, the rainy weather held off till we were finished and we look forward to working with Fraser Mills Fish Hatchery again in the fall. Hi Everyone! First, I want to start out by introducing myself. 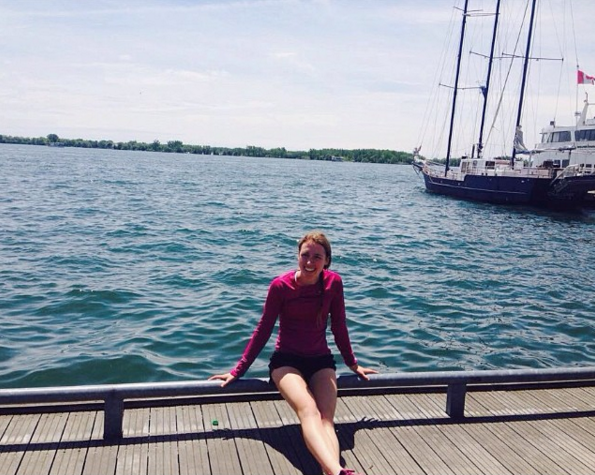 My name is Kayla, and I am a first-year student in the Natural Resource Environmental Technology program at NSCC. I have been hired by CRSA through the Clean Foundation to be the Stream Restoration Crew Leader and represent a Youth Corps leader for my summer work term. I am really enjoying it and I am excited to get the rest of the summer students here to get our hands dirty out on the river. The Annual Fishing Derby event is hosted CRSA and is always held during Nova Scotia's official Sport fishing weekend. 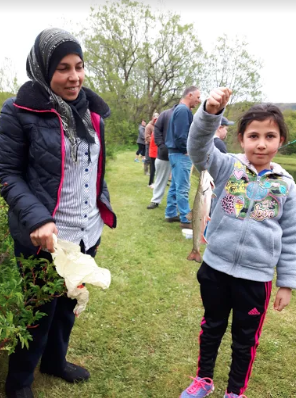 The goal is to offer an outlet for families to come and enjoy a fun outdoor activity by getting kids involved and provides great opportunity for people of all ages to get out for a day of fishing. The derby started at 8 am on June 4th, however the lake was open to the public at 6 am and from what I heard there were many catches early in the morning. We had the BBQ running all day and plenty to drink. The derby ended at noon where we the gave out smaller prizes to the younger children for their participation in the event and also gave out prizes for the top youth anglers. Top prize went to Maria Aucoin (13)- 2lb 3oz, Second place prize Declan Deveau (5)- 1 lb 10oz, Third place Damien Grace (6)- 4.9 oz, and fourth place was Eli LeBlanc (5) 4.0oz. The Cheticamp River Salmon Association would like to thank everyone who came out to the derby yesterday and helped make this day another success. To all the volunteers and board members who helped and donated their time and recourses. To the families for taking part in this event and, despite the poor weather conditions, for sticking it out throughout the day. We saw lots of smiling faces. A big thank you to all our local business for your generous donations (Happy Clam Café, Évangeline Restaurant, Harbour Restaurant, Le Gabriel, Cheticamp Boat Builders, Mr. Chicken, Wabo’s Pizza) Its wonderful to see our community coming together to support each other and I know the prize winners appreciated it. I also want to thank the Cheticamp Co-op for donating the food for the BBQ, it was greatly appreciated and enjoyed. Overall, it was a great and we hope to see you all next year! The Cheticamp River Salmon Association is happy to announce that its annual fishing derby will be held Sunday, June 4th. The derby is taking place in Grand Etang, at Petit Lac (Delaney Lake). The lake will be open to the public from 8 am to 12pm for a day of free fishing – no fishing license is required to fish on this lake for this day only. This is a great opportunity to try sport fishing, and is also a fun outdoor activity for the whole family. As part of the derby, there will be a BBQ as well as a biggest fish competition for anglers 16 years and younger, with prizes for the top catches donated by local businesses. So, bring your fishing poles and come out to catch some trout! The lake will be stocked prior to the derby, and so will be closed and patrolled by DFO staff starting at 6 am on Thursday June 1st . The lake will be reopened for fishing starting at 6 am on the morning of the derby. L'association du saumon de la rivière de Cheticamp aimerait d'annoncer que leur derby de pêche aura lieu le dimanche 4 juin au Petit Lac (Delaney Lake) à Grand-Étang. À partir de 8h du matin, le Petit Lac sera ouvert gratuitement au publique - aucun permis de pêche n'est requis pour pêcher au Petit Lac pour cette journée seulement. Le derby sera une excellente occasion d'essayer la pêche sportive, et aussi une activité de plein air amusante pour toute la famille. Le derby sera accompagné d’un BBQ et d’une compétition pour les participants de 16 ans et moins. Des prix subventionnés par des entreprises locales seront accordés aux pêcheurs qui réussissent d’attraper le plus gros poisson. Alors, le 4 juin, venez pêcher des truites avec les membres de l’association du saumon de la rivière de Chéticamp. Notez que le Petit Lac sera stocké avant le derby et sera fermé le jeudi 1 juin pour rouvrir de nouveau le 4 juin à 6h pour le derby. First couple weeks with the summer crew! The first couple weeks have been busy for the new CRSA summer students Jeremy Camus and Mathieu Muise. Our first week involved many orientation activities, Occupational Health and Safety training sessions and water quality monitoring of the Aucoin Brook. Last Tuesday, we attended the Adopt a Stream training day in Margaree where we had the opportunity to learn about various in-stream structures and even got to help install a digger log! Last Thursday we volunteered at the Margaree Fish Hatchery and helped transfer thousands of young salmon to new pools. The same day we had a nice visit at the Margaree Salmon Museum. Monday morning was greeted with some wet weather, but we had the opportunity to learn from CRSA President, Rene Aucoin, how to tie some simple flies during an impromptu workshop. Tuesday we were lucky to have Rene Aucoin take us out for some Flycasting lessons on the Cheticamp River! Wednesday we helped out on the Cheticamp River by putting in hay bales to help remove excess sediment from the stream during heavy machinery work. We also had our first go at removing some impressive beaver dams in the Aucoin Brook, what hard work! Thursday we partnered with workers from GAMS (Gulf Aquarium and Marine Station Cooperative) and got to help sample many interesting invertebrate species along the shore line of Cheticamp! Last Tuesday, experienced angler from Margaree, John Hart, and Master Flycasting Instructor from the Atlantic Salmon Federation, Lewis Hinks, shared their expertise, rods and flies with the 6th and 7th grade students from Ecole N.D.A. The workshop was divided into two lessons. At one station, John Hart taught students Clinch knots to attach hooks to lines. At the other, Lewis Hinks taught them to cast and provided expert tips throughout the lesson. Students then got to head down to the pond and test out their new skills. Many students were quick to hook fish and several of them caught impressive Rainbow and Brook trout from the pond. They encouraged each other as they battled to bring larger fish to the banks, and smiled for pictures with their instructors and catch. The CRSA would like to thank the students and teachers who participated in the workshop and for making this year such a great success. A special thanks also goes out to Robert Leblanc, who was a great help and kindly contributed his time and experience with the students as well as Joel Camus who generously offered his fishing pond and surrounding property to be used for practice. Hi there! My name is Gabrielle and I am the new student crew leader working with the CRSA on the Aucoin Brook restoration project. I am so excited to have this opportunity and to work in such a lovely community. The season is just starting up and I've already had so much fun helping out with the annual Fishing Derby last sunday, June 5th. There is much more to come and lots to look forward to, so stay posted! Here's a look at last weekend's Fishing Derby at Petit Lac hosted by the CRSA! The derby was held during Nova Scotia's official Sportfishing weekend. This annual occurrence allows for resident and non-resident anglers to fish without a licence and provides great opportunity for people of all ages to get out for a fun day of fishing. This year's derby kicked off at 6am with some early birds setting up for a beautiful day of fishing. Many families started to arrive around 8am, and as the hunger started to set in, the CRSA fired up the free BBQ from 9:30am until shortly after noon. At this time, we did the final weigh-in and handed out prizes to all children and youth. The first place prize was awarded to Emily Leblanc (12) with her mighty two pound twelve ounce brook trout. The second place prize went to Tyler Arsenault (5) who caught an impressive two pound eleven ounce brook trout. The third place angler was Dawson Timmons (10) with his superb two pound five ounce brook trout. A big thank you to our volunteers, as well as to everyone who came out and made this year such a big success! A special thank you to the local businesses (the Frog Pond cafe, Mr. Chicken, Wabo's Pizza and the Cheticamp Co-op) who donated the prizes for this year's event. We look forward to seeing everyone again next year! The Cheticamp River Salmon Association is continuing its partnership with Cape Breton Highlands National Park and planning for a third phase of habitat restoration work on the Cheticamp River. The work planned for this year will build on work completed in the first two phases of the project (2014 and 2015), aiming to improve fish passage at critically overwidened sites on the lower river. We will be sharing more information on this project as preparations get underway. In the meantime, here are some photos of recent work completed on the Salmon Pools trail, a Parks Canada trail that the habitat restoration team used as one of the main access routes for Phase II work sites. Conditions on the trail have been improved as far as the Fence Pool in order to allow the safe passage of heavy equipment and the delivery of materials for the instream structures at upper work sites. Looking forward to another busy and exciting field season. Stay tuned for further updates.